SAN FRANCISCO & EAST RUTHERFORD, N.J.--(BUSINESS WIRE)--Oct. 17, 2018-- Visa Inc. (NYSE: V), the Official Payment Services Partner of the NFL, today announced the launch of its new and improved Financial Football video game for the 2018 - 2019 NFL season at an event in New Jersey with New York Giants stars, Eli Manning and Saquon Barkley. The free video game lets fans ages 11 and older suit up as a player from their favorite NFL team and play a virtual game of football designed to help students learn to make smart money-management decisions. Research shows one-in-five teenage students in the U.S. lacks basic financial skillsi. Forty percent of adults said that if faced with a $400 unexpected expense, they would either not be able to pay it or would do so by selling something or borrowing moneyii. As new payment methods such as mobile payments, contactless cards and wearables become more prevalent, it underscores the need for financial literacy starting at an early age and continuing into adulthood. 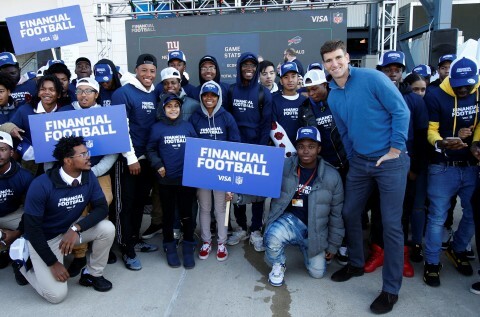 At MetLife Stadium in New Jersey, Giants stars, Eli Manning and Saquon Barkley hosted more than 100 high school students for the official launch of the new Financial Football video game. The two players coached the head-to-head game competition and led students through skills and drills activities focused on financial education categories.